Hayes 1922 wire strainer; it has a tubular handle with a pair of spring-loaded jaws at one end. The jaws hold a chain with a scissor-jawed wire holder at the end. Wire fencing became a commonly used type of fencing from the 1850s, previous types of fencing included wood post and rail fencing, ditch-and-bank, hedges, stone walls or boundary keepers, who were used for the larger stations, but wire fencing did come with its own problems, especially in the variable climate of Oturehua, Otago, with the hot summers causing sagging wires and cold winters causing wires to snap from frost, as well as wear and nicks on the wire allowing rust. 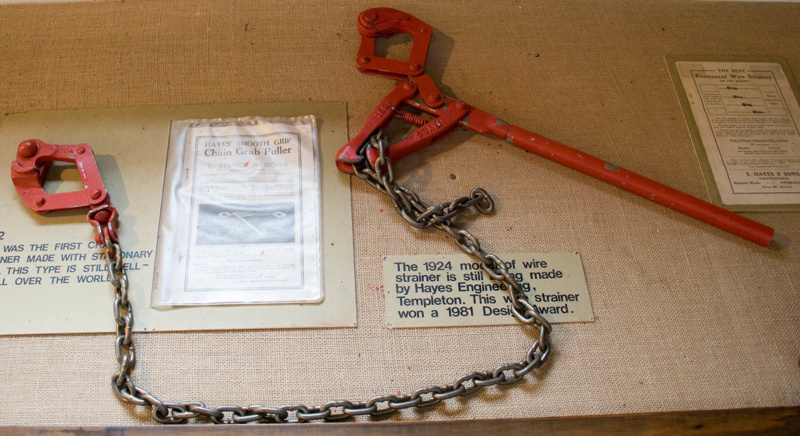 Ernest Hayes refined the technology and manufactured both permanent, where the strainer stays on the wire after straining and can be tightened or loosened afterwards and portable (or parallel) wire strainers, which enable two wires to be secured separately and drawn together to achieve desired tension with enough wire left to fix together and around posts. Hayes became well-known for the portable Monkey brand wire strainer, which did not break the galvanised coat on the wire.